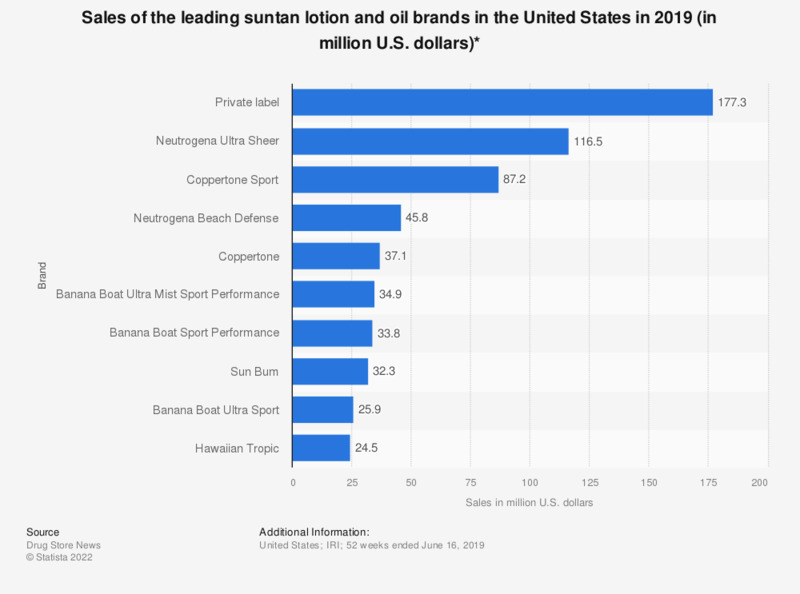 The statistic shows the sales of the leading suntan lotion and oil brands in the United States in 2018. In that year, Coppertone Sport was the third leading suntan lotion brand in the United States with sales of 102.7 million U.S. dollars. Everything On "Sun Care Industry" in One Document: Edited and Divided into Handy Chapters. Including Detailed References. Statistics on "Sun Care Industry"
U.S. population: How many bottles of suntan / sunscreen and sunless tanning products for your face did you use in the last 12 months? U.S. population: How many bottles of suntan / sunscreen and sunless tanning products for your body did you use in the last 12 months? U.S. population: Which types of suntan / sunscreen and sunless tanning products do you use most often? U.S. population: Which brands of suntan / sunscreen and sunless tanning products for your face do you use most often?